Family harmony and peace returns! One question I get asked a lot is how to keep a house clean. This might seem like a simple question, but there is a little more to it! We all want a clean and tidy home, but sometimes there just isn’t time to constantly clean every day. It would be great to be able to clean for 2 or 3 hours every day (or better yet… have someone else do it! ), but that’s just not practical for most of us. So how do you keep your home clean when you just don’t have time? Best of all… being more relaxed and not getting angry at your family! You’ve probably had those days where you’ve spent a few hours cleaning the house from top to bottom. You are tired, but pretty pleased that your home is now clean and you can relax. Except… the next day, the kitchen is a mess, there’s a pile of laundry and toothpaste in the sink. How did that happen? You know the house was clean yesterday! That’s when your heart drops. You feel so disappointed and upset. Why did you even TRY to clean the house if it was just going to get messy again? But there is a solution! I promise you, it is possible to keep your house clean without spending hours of time every day! I have 3 kids, 4 dogs, 4 cats and 5 chicken! My house can descend into chaos very very quickly if I don’t keep on top of things. OK, so the chickens don’t live in the house, but everyone else tries very hard to mess up the house most days! Below are 10 tips that I use every day to help keep the chaos away! These tips will help you keep your house clean without spending hours scrubbing or yelling at your family! A word aboutnew habits – it can be difficult to stick to a new habit if we make too many changes at once. So I suggest you pick one or two of these ideas and use those first. Once they become a habit, you can slowly add more. The first 5 tips are from my Weekly Cleaning Schedule – I call them my Daily Dos! If I get nothing else done each day, I make sure I do these! I’ve been doing them for so long that they are just a habit now. The most important of these Daily Dos to me, is to make my bed every day. This is a habit that my mother taught me as a child and I’ve taught my children. A messy room will look a bit tidier if the bed is made. But a tidy room will never look nice if the bed is unmade! Make life easy for yourself and keep your bedding simple. Having 30 throw pillows on your bed is really not necessary! The next easy way to keep your house clean is to do one load of laundry every day. 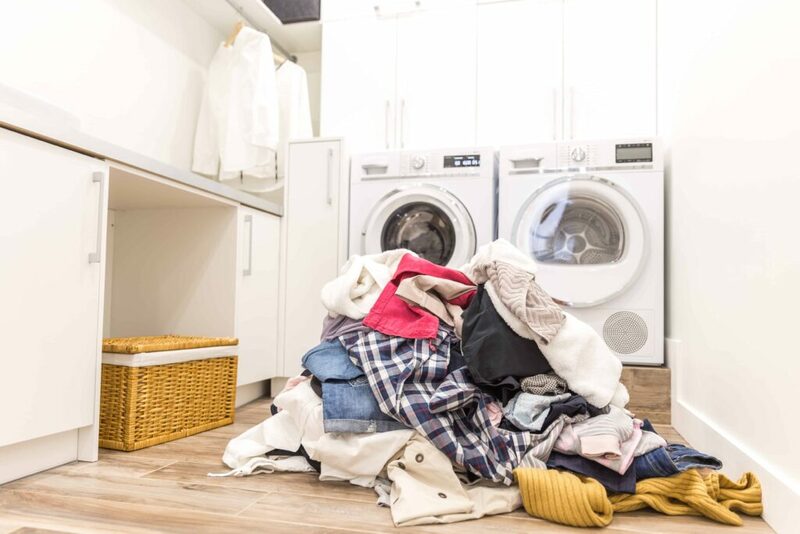 You might think that you don’t have time to do a load of laundry every day, but because it is a much smaller load, it’s so much quicker to sort, wash and put away. Get into a routine of putting the clothes in the washer first thing in the morning. Then when you get home in the evening, switch them over to the dryer and, finally, after dinner you can quickly put all the clothes away. Trust me, it doesn’t take long if you do it every day. Some people won’t have enough laundry to do it every day. Please don’t run your washing machine for just one pair of pants, underwear and a shirt! If your household is smaller, then you might be able to do a load every other day or third day. Just don’t leave it too long! This tip for keeping your house clean is very similar to doing laundry every day – run your dishwasher every day too (same as the laundry, if you don’t have a full load, then save energy and wait for the following day). Again, this is all about habit. Every morning while the kids are eating their breakfast I empty the dishwasher. 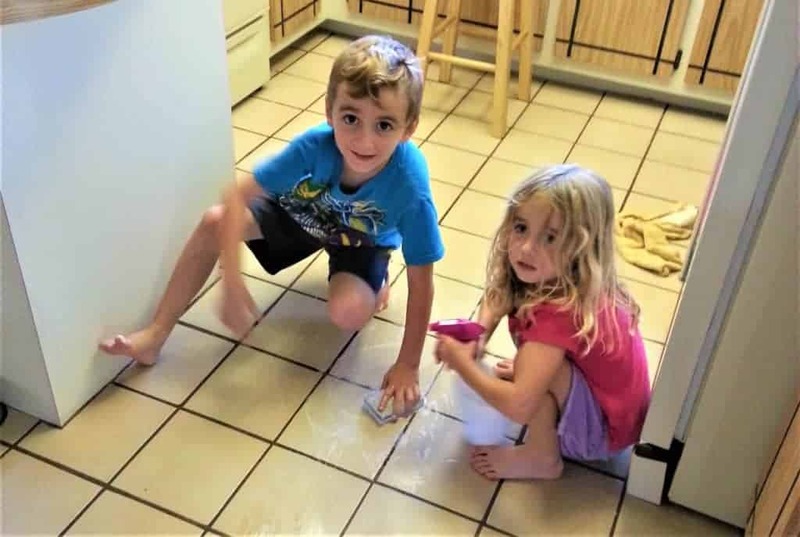 It doesn’t take long and I’m in the kitchen with the kids and can chat about what they will be doing that day. Having the dishwasher empty in the morning at the beginning of the day means that I can load it up with the dirty dishes through out the day. As I’m cooking lunch or dinner, the dirty dishes and utensils can go straight into the dishwasher and keep my counters clear. After dinner I load the last few things into the dishwasher and then set the timer for it to run overnight. One thing that will make a big difference in keeping your home clean is wiping down your counters every day. If you can get into the habit of wiping down your kitchen and bathroom counters every evening, then you are definitely on your way to having a clean home every day! You don’t need to spend ages scrubbing them counters. Just use your favorite cleaning spray and a damp microfiber cloth. It’s so fast and it will make a big different. This is another tip that my mother taught me to keep my house clean and tidy. Seriously, my mother was tidier than Martha Stewart! So, her advice is well worth following! When you have finished using something PUT IT AWAY! Don’t wait and say that you will get to it later… that’s how you end up with piles of stuff everywhere! Take a moment or two to put things away right after you use them. It doesn’t take long and it will save you time in the long run. This applies to everything… kitchen utensils, craft supplies, clothes, cosmetics, tools, toys… everything! We all love that “just cleaned” feeling in our homes, but it can be really disheartening when it gets messy again quickly. One way to keep you house clean every day is to stick to a cleaning schedule. I use a simple weekly cleaning schedule that means I never forget about cleaning the bathroom or have to remember when I last mopped the floors. A good cleaning schedule will help you feel more in control and less overwhelmed too. We often have that nagging thought in our heads, “I must clean the bathrooms today”, but we never quite get to it. So the next day that nagging feeling gets worse and worse. And then eventually we are stressed out and feel like a failure because we can’t do something as simple as clean the bathrooms! With a good cleaning schedule in place, you never get that nagging feeling. If Wednesdays are your bathroom day, then you know that’s when you will clean them. No doubt, no feelings of overwhelm or failure! One big problem with keeping our homes clean is tackling piles of clutter and one of the biggest culprits of clutter is piles of papers! Getting into a habit of opening your mail right away will REALLY help you stay in control of your paper clutter. When I go to the mailbox, I start sorting it as I’m walking back to the house. All the junk mail and fliers go into the big outside garbage can! They don’t even make it into the house! Then I stand next to the recycling can and open the rest of the mail. I only keep papers that I really NEED! Making the most of the tiny windows of time we have in our day can really make a difference when trying to keep a house clean. Instead of staring at your Keurig machine while it makes your coffee in the morning, why not grab a few things and put them away? As you are waiting for your kids to finish their breakfast, why not empty the dishwasher? While you are brushing your teeth, use your other hand to put away some of your cosmetics and bottles? Anytime you find yourself just idly waiting, then look around and see what you can do instead. I feel like I mention this cleaning tip a LOT! But it is one of my favorites! Having a good quality run or door mat will help keep your house clean. If the dirt gets trapped before it comes into the house, then you don’t need to worry about it making your floors messy! I suggest having a good heavy duty mat outside your front door and any other entrances into your house that you regularly use (backdoor, garage door, etc). In addition to that, I like to put a utility rug inside all the doorways too This just catches the last of the dirt that the outside doormat misses! Utility rugs come in lots of different colors and styles, so you can easily find one that suits your home decor. Sometimes it can just seem too overwhelming to get our homes clean. It’s at times like thi, that you need to enlist some help! That help could be from your family, a friend or even a professional cleaning service. Once you’ve got your home clean, it’s much easier to keep it clean. Just make sure you have a plan for HOW you are going to keep it clean… or it will just get messy again! It can be difficult to get your family to help around the house, but take the time to calmly explain to them that you need help! You can’t do it all yourself and it’s important that you all work as a team! If you have a friend who is in a similar situation to you (i.e. desperately wants a cleaner home! ), then why not help each other out? Cleaning is far more fun if you have someone to chat with while you are doing it! And if all else fails… many professional cleaning companies offer one-off cleaning services. It’s not the most budget friendly option, but if it helps you kick-start your new clean house habit, then maybe it’s worth it! I truly hope that these tips will help you keep your home clean and tidy. But remember the biggest hurdle is often our own mindset! If you think of yourself as an expert housekeeper and you will become one!